Lil Wayne is an epitome of fast rap and is known as one of the best-selling artists of all time in the game of rap. Widely known for his songs Sucker for Pain”, “Lollipop” and “How to Love”, Lil Wayne started rapping at age 9 and years into his career he blissfully topped the US chart as the male with the most entries on the Billboard Hot 100 chart, with 109 songs. The short rhymester has since stayed relevant, so it is worth highlighting his journey thus far. Born Dwayne Michael Carter, Jr. on September 27, 1982, Lil Wayne grew up in New Orleans under the care of his 19-year-old mom and late stepfather, Reginald “Rabbit” McDonald who was killed before Wayne became successful. His biological dad, Dwayne Carter abandoned them when he was just two years old and though he is still alive, he has no concrete relationship with the star. With a childhood that proved more different from most, Wayne had to start hustling quite early. He wrote his first rap song at an early age of 8 while he attended Lafayette Elementary School. He furthered his education at Eleanor McCain Secondary School and was an honors student. He later transferred to Marion Abramson Senior High School and at age 14, he dropped out of school to pursue his musical career. After finding initial success in music, he tried to complete school and joined the University of Phoenix. Unfortunately, his schedule was already too tight for school and he dropped out the same year he began. Wayne started out in 1991 when he was signed to Cash Money Records after Bryan Williams discovered him and helped to hone his rap skills. In 1996, he became part of Hot Boys which has other mega rappers such as rappers Juvenile, B.G, and Turk as members. Though he was the youngest of the team at age 15, Wayne’s impact could be felt in the group. After a few songs with the group, he moved on to continue his rap career on his own and released his first album The Block is Hot in 1999. The album was successful and he held on to the achievement to drop more raps. The success also helped in placing him in the spotlight. Currently, he has numerous songs to his name and has worked with many equally famous and rich stars who are renowned for making a huge difference in the trap world such as Nicki Minaj, Eminem, DJ Khaled, etc. Is the Cancer Speculation True? Lil Wayne loves body arts and tattoos, thus has numerous collage of it on his skin. He continues to ink in new ones and changing old ones with new designs. Because of his love for tattoos, there have been many hoax stories on different internet sources since 2015 claiming that the rapper has a life-threatening cancer diagnosis. It was also reported then that he had just one month to walk the earth. However, Lil Wayne has never spoken about these claims or talked about any health issues and his impending death. Therefore, it is not certain whether or not he suffers or had suffered any kind of cancer. But apparently, he is hale, hearty and surrounded by love including his children and other family members. Lil Wayne has a controversial love life. He has been in different commitments in the past. His first known girlfriend was Antonia Toya Carter who was his high school lover and whom he wedded on Valentine’s Day in 2004. Their marriage ended two years later and he got romantically involved with different women including radio broadcaster, Sarah Vivian, actress Lauren London who is famous for her roles in the TV shows 90210 and Entourage. Wayne has also dated the Grammy-nominated singer and the brain behind the song “Don’t Mess With My Man,” Nivea. It didn’t end with Nivea, the Rapper continued to have some flames with more women and rapper Trina didn’t miss out on the spree. As common with men who have many affairs with different women, rapper Wayne has four children from different women he has had dated in the past. 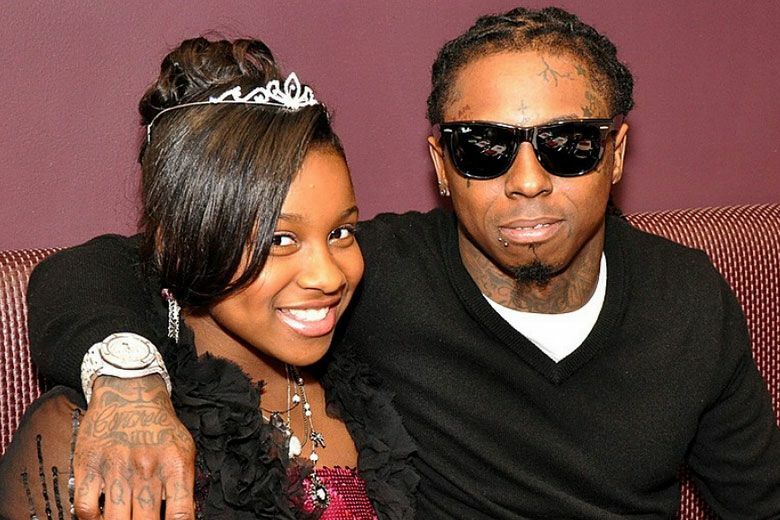 His first daughter Reginae who is also a famous R&B artist was born on November 29, 1998, while Wayne was still in high school with her lover Antonia Toya Carter. She and fellow rapper YFN Lucci are currently rumored to be dating. Wayne is very fond of her as she is his only daughter. At her 16th birthday, Lil Wayne brought Nick Minaj to perform at her party titled “Reginae sweet 16 all-white party” and also got her expensive cars, a red BMW and a black and white Ferrari. Also, his affair with Sarah Vivian produced his second child who is the rapper’s first son named Dwayne III. He was born on October 22, 2008. Beautiful actress Lauren London had his third child named Cameron Carter, a year after Dwayne III was born and his fourth child (third son) Neal was born by singer Nivea. He could have had another child but Trina miscarried her pregnancy. Currently, Wayne is single legally but he has been with different women. His alleged relationship with actress Christina Milian ended in 2015 after they attended the ESPY Awards together. Given his achievements in America’s music industry, Lil Wayne is one of the wealthiest in the world. His record sales are huge and he commands over $600,000 for any show he performs. For a rapper who attends over 40 shows every year, it is not surprising that his net worth stands at $150 million and he is still enjoying massive success to date. 1. Lil Wayne is 1.65 m tall that is 5 feet 5 inches and his body weight is 59 kg. He wears US size 8, UK size 6 and European size 39 shoes. 2. His birth sign is Libra and he enjoys skating. 3. Wayne loves to stay hydrated and spends a lot of time training his body at the gym. 4. The rapper has been given different nicknames amongst them are Weezy F. Baby, Lil’ Weezy, Baby Jr., Birdman Jr., etc. 6. He made his first big money from music at age 14, which was a whopping $6,500.